These corps love a parade! If you can't make it out to any of the DCI Tour events scheduled for this Independence Day weekend, or if you want to make sure you include even more drum corps in your holiday festivities, check out this list of corps that will be marching in Fourth of July parades across the United States! After you see a drum corps marching down a boulevard near you, make sure to send us your most patriotic drum corps parade photos from the Fourth! E-mail your best shots to dceye@dci.org after the holiday, and your shot may be included in a future DCI.org article. Be sure to provide brief background information about yourself and where you took the photo. For additional information about corps' schedules for Independence Day, visit their Web Sites. Boston Crusaders July 4 – Chelmsford, MA July 4 – Manchester-by-the-Sea, MA July 4, 5 p.m. – Wakefield, MA Visit Boston Crusaders online. Carolina Crown July 4, 10 a.m. – Bristol, RI July 4, 5 p.m. – Wakefield, MA Visit Carolina Crown online. The Cavaliers July 4, 9 a.m. – Niles, IL July 4, 12 p.m. – Elmwood Park, IL July 4, 2 p.m. – Evanston, IL Visit the Cavaliers online. Citations July 3 – Gloucester, MA July 4 – Burlington, MA July 4 – Merrimack, NH July 4 – Wakefield, MA July 5 – Stoughton, MA Visit Citations online. July 4 – Multiple Chicagoland locations Visit the Colts online. Colt Cadets July 4 – Multiple Chicagoland locations Visit the Colt Cadets online. Crossmen July 4, 10 a.m. – Bristol, RI July 4, 5 p.m. – Wakefield, MA Visit Crossmen online. Crusaders Senior Drum & Bugle Corps July 4, 10 a.m. – Hingham, MA July 5, 2 p.m. – Stoughton, MA Visit the Crusaders Senior Drum and Bugle Corps online. 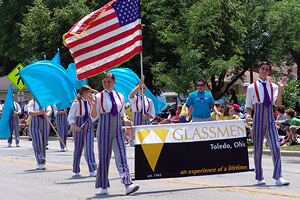 Glassmen July 3, 7 p.m. – Menomonee Falls Independence Day Parade / Concert July 4, 9 a.m. – Niles, IL July 4, 12 p.m. – Skokie, IL July 4, 2:30 p.m. – Morton Grove, IL July 5 – Michigan City Independence Parade, Michigan City, IN Visit the Glassmen online. Gold July 4, 10 a.m. – Westchester, CA Visit Gold online. The Govenaires July 4 – St. Peter, MN July 4 – Chanhassen, MN Visit the Govenaires online. Gulf Coast Sound July 4, 10 a.m. – City of Meadows Place, TX Visit Gulf Coast Sound online. Holy Name Cadets July 4, 10 a.m. – Bristol, RI July 4, 5 p.m. – Wakefield, MA Visit the Holy Name Cadets online. Impulse July 4, 10 a.m. – Huntington Beach, CA July 4, 2 p.m. – Pacific Palisades, CA Visit Impulse online. Incognito July 4, 10 a.m. – City of Rosemead, CA Visit Incognito online. Jersey Surf July 4, 11 a.m. – Philadelphia, PA July 4, 4 p.m. – Glenside, PA July 4, 6 p.m. – Washington Township, NJ Visit Jersey Surf online. Legends July 4, 10 a.m. – Lake Bluff, IL July 4, 12 p.m. – Northbrook, IL July 4, 2:30 p.m. – Deerfield, IL Visit Legends online. Madison Scouts July 4, 11 a.m. – Cedarburg, WI July 5, 1 p.m. – East Troy, WI Visit the Madison Scouts online. Memphis Sound July 3, 7 p.m. – Menomonee Falls, WI July 4, 9 a.m. – Racine, WI July 4, 1:30 p.m. – Brown Deer, WI July 4, 3 p.m. – Shorewood, WI Visit Memphis Sound online. Muchachos July 4, 12 p.m. – Andover, NH (with standstill in park following) Visit the Muchachos online. Music City Legend July 4 – Dundalk, MD July 4 – Arbutus, MD July 4 – Towson, MD July 4 – Bel Air, MD July 4 – Catonsville, MD July 5 – Havre de Grace, MD Visit Music City Legend online. Oregon Crusaders July 4, 11 a.m. – Seaside, OR Visit the Oregon Crusaders online. Phantom Regiment July 4, 11 a.m. – Cedarburg, WI July 4, evening – Rockford, IL Visit Phantom Regiment online. San Francisco Renegades July 4, 10 a.m. – Fremont, CA Visit the San Francisco Renegades online. Santa Clara Vanguard July 4, 11 a.m. – Seaside, OR Visit Santa Clara Vanguard online. Spirit July 4, 9 a.m. – Niles, IL July 4, 12 p.m. – Skokie, IL July 4, 2:30 p.m. – Morton Grove, IL July 5, 1 p.m. – Michigan City, IN Visit Spirit online. Teal Sound July 4 – Philadelphia, PA July 4 – Glenside, PA July 5 – Harve de Grace, MD Visit Teal Sound online. Velvet Knights July 4, 10 a.m. – Rosemead, CA Visit Velvet Knights online.